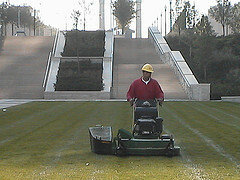 The professional lawn, landscape and tree trimming industry is a significant part of the service sector. As a result of a strong housing market boosted by low interest rates, this industry has seen tremendous growth. In 2002, $28.9 billion was spent in this industry and it continues to grow – partly attributed to the “do-it-for-me” mindset of the 77 million baby boomers who have more money than time. This industry is made up primarily of small businesses – 72% of which have 5 or fewer employees. A quarter of these businesses are located in California, Florida, New York and New Jersey. Overall, the 72,504 professional lawn, landscape and tree trimming businesses employ 446,111 people (this does not include proprietorships with no employees). Sources: Harris Interactive and the Professional Lawn Care Association ); National Gardening Association; US Census, County Business Patterns, 2001. Source: US Census, County Business Patterns, 2001, NAICS 56173. Includes only establishments with employees. Why Do Homeowners Like Lawns and Landscapes? According to the Research Alert, 19 (6): 2, March 16, 2001 the most common reason cited for having a well-maintained lawn and landscape at a residential or commercial property was the beauty and relaxation it provides for family, employees or visitors. New homeowners and buyers of previously owned homes believe that landscaping adds nearly 15%, on average, to a home’s value or selling price. Real estate appraisers, on the other hand, put the value at 7.28% for residential and 6.0% for commercial properties, according to Gallup data cited. Who Buys Landscaping and Gardening Services? Source: Household Spending: Who Spends How Much on What, 8th Ed. New Strategists: Ithaca, NY, 2004. What do Landscape and Lawn Care Businesses Charge? This material is based upon work supported by the U.S. Small Business Administration. Any opinions, findings, conclusions or recommendations expressed are those of SBDCNet and do not necessarily reflect the views of the U.S. SBA. This U.S. Small Business Administration (SBA) Grant is funded by the SBA. SBA’s funding is not an endorsement of any products, opinions, or services. All SBA funded programs are extended to the public on a nondiscriminatory basis.